A government watchdog group is calling on a number of high-ranking Democratic senators to return campaign cash they received from the super PAC of Democratic Sen. Bob Menendez (N.J.), who is now on trial for corruption charges. Menendez made tens of thousands of dollars in contributions to the campaign committees of Sens. Elizabeth Warren (D., Mass. ), Tim Kaine (D., Va.), Debbie Stabenow (D., Mich.), Jon Tester (D., Mont. ), Kirsten Gillibrand (D., N.Y.), and Chris Murphy (D., Conn.) long after Menendez was indicted on alleged corruption charges, the Washington Free Beacon previously reported. "The fact that Senators took campaign donations from Menendez's New Millennium PAC well after Menendez was indicted on a long list of very serious charges amounts to a tacit endorsement of egregious and potentially criminal behavior," said Matthew Whitaker, executive director of the Foundation for Accountability and Civic Trust (FACT), a Washington, D.C.,-based watchdog group. "The hypocrisy of some of these Senators when it comes to passing ethical judgment on others is astounding, as they are often the first to cry foul when the appearance of impropriety involves their political opponents," added Whitaker. "Therefore, I think for the good of consistency, and more importantly transparency and maintaining trust in government, the PAC donations should be returned." Menendez gave $10,000 to the campaigns of Kaine, Stabenow, Tester, and Gillibrand from the New Millennium PAC, his super PAC. Menendez also gave $5,000 to the campaign committees of Warren and Murphy. Menendez made the contributions to his Democratic colleagues between February and June of this year. "Instead of distancing themselves from Bob Menendez after his indictment on bribery charges, his Democrat colleagues have stood behind him, even accepting tainted campaign cash from the disgraced Senator," Bob Salera, the deputy communications director for the National Republican Senatorial Committee (NRSC), told the Free Beacon last week. 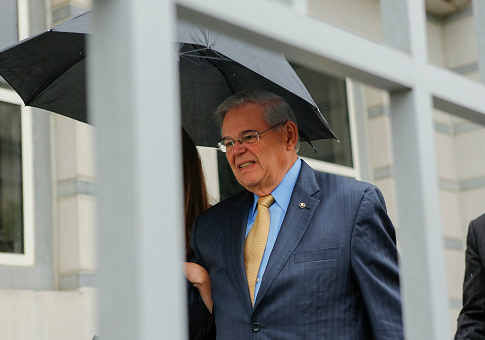 "If Senate Democrats don't return Menendez's donations, voters should take their inaction as a tacit endorsement of his corruption." Menendez, whose trial began last week, is facing 12 counts of corruption charges that include alleged bribery. Prosecutors have said the Democratic senator accepted bribes from Dr. Salomon Melgen, an eye doctor, who was a previous high dollar donor to Menendez. Menendez took numerous flights on Melgen's private jet to the Dominican Republic and failed to report the activity on his annual financial disclosure form. "The defendants' bribery scheme began shortly after Menendez’s elevation to the Senate in 2006, when Melgen began a pattern of treating Menendez to weekend and weeklong getaways in the Dominican Republic that would continue for the next several years," said prosecutors. "For the first four years of the corruption scheme, the all-expense paid trips Melgen provided often included free roundtrip flights on Melgen's private jet for Menendez and his various guests. When the doctor's private jet was unavailable, Melgen supplied equally luxurious travel for the Senator." Politico reported Wednesday that a top aide to Menendez had criticized him for personally lobbying ambassadors to get visas for Melgen's girlfriends. Portions of a 2009 email from Mark Lopes, a former senior adviser to Menendez, were read to the court as the jury sat outside of the courtroom. Menendez "does not need to be calling U.S. ambassadors about stuff like this," Lopes wrote within the email. The email appeared to contradict earlier statements from Lopes. None of the Democratic senators returned previous requests for comment on the campaign donations from Menendez. This entry was posted in Politics and tagged Bob Menendez, Democratic Donors, Elizabeth Warren, Senate Democrats. Bookmark the permalink.